Enviromental Protection Minister Ze'ev Elkin backs Prime Minister Netanyahu, urging the public not to jump to conclusions. Minister of Environmental Protection Ze'ev Elkin (Likud) offered up a defense of Prime Minister Binyamin Netanyahu, urging the public to refrain from jumping to conclusions about the premiers guilt in the multiple ongoing police investigations against him. 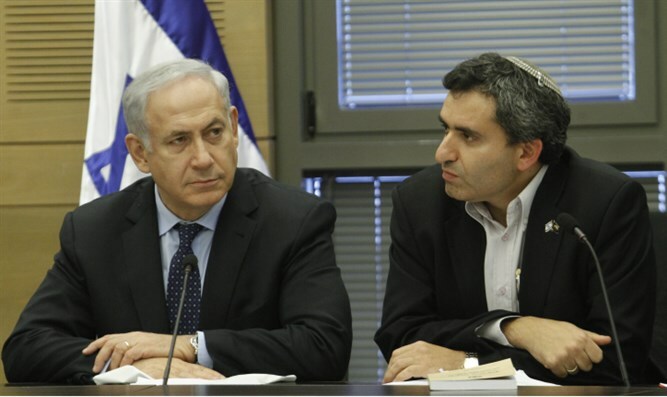 "Netanyahu cannot present his version of things," Elkin told the Reshet Bet radio station." Everyone shows only the version that accuses him, so it is an unfair contest." A fresh poll suggested that the public was increasingly losing faith in Netanyahu. According to a survey commissioned by Channel 10, 51% of Israelis do not believe Netanyahu is innocent, and 66% want him to resign if he is indicted. Elkin waved off the results of the poll. "The public's attitude is not surprising, considering that for a few days all they heard in the media is that Netanyahu has already been convicted, so obviously this has an impact on the question of the public's trust, "explained Elkin. A recent barrage of news reports seemed to show the legal noose tightening around Netanyahu. This past Thursday, police announced that they suspect Netanyahu of bribery and fraud, and his ex-chief of staff Ari Harow turned state's witness, and plans on testifying against his former boss. Police are also running a parallel investigation, called 'Case 1000,' looking into expensive gifts wealthy friends lavished on Netanyahu, such as the cigars and champagne gifted to him by the billionaire Arnon Milchan. A slew of prominent right wing figures also announced their support of the embattled Premier. Education Minister and Jewish Home leader Naftali Bennett announced his hope that Sunday that Netanyahu would remain in power. “Israel needs stability and we need to support the national government, and we are committed to its continuation" he said in a statement. Former Likud minister Gideon Sa'ar, who many view as a potential leader for the Likud, also gave Netanyahu his full backing Monday, contending that there was no basis for him to resign. "It also would not be right for him to do so," he said.